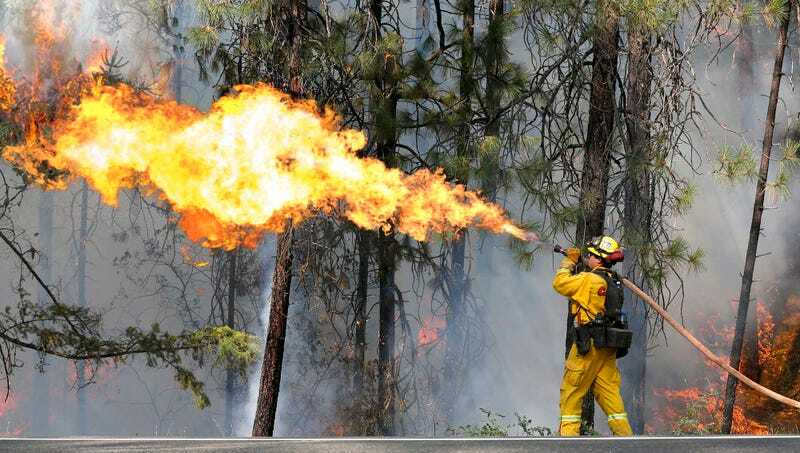 WITTER SPRINGS, CA—Mortified at making such a boneheaded mistake during the largest blaze in state history, embarrassed California firefighters realized Tuesday that they have been spraying flames this whole time. “Aw, jeez, we’ve been using the fire cannons all along? That explains a lot,” said state firefighter Greg Vandermeer, adding that he was really kicking himself for not speaking up when he noticed most of the department’s efforts to fight the fires just seemed to be spreading the blaze further into the dry brush and dense scrub oak. “It was pretty stupid to store the fire tanks right next to the water tanks back at the station. But in the heat of the moment, it’s hard to tell the difference between fire in front of you and what’s coming out of your hose. It’s all just so hot. Gosh, we’re really going to hear it for this. Especially after wasting so much fire.” Vandermeer then noted that he hoped the pilots in their firefighting helicopters had double-checked to hit the button that drops stores of water rather than the one for smoldering coals.